If you are thinking of getting an aquarium or already have one, a hang on filter is a necessity. These accessories, like the name implies, is useful for filtering, as clean water is beneficial for the health of fish and to grow healthy fish. There are different methods of filtration; biological, mechanical and chemical, each posing its own pros and cons. Getting the best hang on back filter is paramount to having an efficient aquarium operating system. There are many various brands of filters in the market; these brands pose a difficult task for buyers trying to sift through to buy the best hang on back filter. Cost: The cost of the hang on back filter is important, as getting the best value for money is really important for aquarium owners. Most will prefer one that they can afford easily and that fits their budget. Ease of set up: Another important factor to take into consideration is how easy it is to set up this filter. As some may prefer a filter that would need a technician to fix, while others who are the DIY people would prefer a filter they can set up and fix by themselves. Noise levels: Most would prefer filters that are as quiet as possible, which would not disturb the fish. Getting a noiseless and efficient filter is of importance. Energy Consumption: Filters that are energy efficient are mostly preferred thereby saving money on monthly energy consumption. Extra features offered by the Filter: Filters that offer complementary features and are versatile are always on the forefront of filters wanted by aquarium owners, as it helps them optimize. Well, now that we have been introduced into what to look out for in hang on back filter, it would be time to take a look at some of the best hang on back filters that can be sourced in the market. Own a current filter that tends to harm its motor or impellers when in use? Then it may just be time to upgrade to a better one. 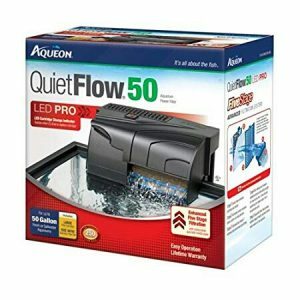 The AquaClear Power Filter-110V is the best upgrade out there; this versatile filter can reduce flow up to 50%, as most aquariums require gentle flow rather than turbulent flow. This filter lets you regulate the flow rate of water without interfering in its efficiency; this filter is outfitted with a multi-stage filtration system. This ensures that helpful bacteria are at a reasonable level in the water. The filtration volume of this filter is up to 7 times larger compared to other obtainable filters and also uses a continuous biological filtration mechanism. This easy to install and maintain filter comes with a complete user manual on how to take care of it. This filter is however not very noise efficient and also requires extra attention as it is delicately built. Aquarium fish and plants need optimum conditions to thrive, a water filter is an important part of what makes these organisms thrive. A good filter should offer superior water quality, ensuring the health of your aquarium. 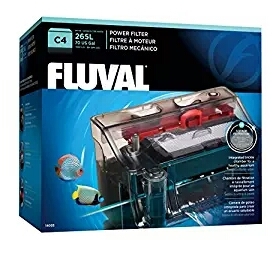 The Fluval C Power FilterFluval C Power Filter is made with a 5-stage filtration system, ensuring maximum efficiency for your aquarium. The 1st and 2nd stages are mechanical where the porous poly/foam pad traps large and fine particles and debris. Stage 3 is chemical where there’s the absorption of undesirable impurities, while stages 4 and 5 are biologically essential to preserve beneficial bacteria. This aquarium with an aesthetic design is suited to small aquarium; it is majorly useful for aquariums between 40 and 70 gallons and filters 264 gallons per hour. This filter is easy to maintain and provides a stress-free environment for your plants and fish. This majestic hang on back filter is made from advanced aquarium technology, which is revolutionalized to fit your aquarium specifications. 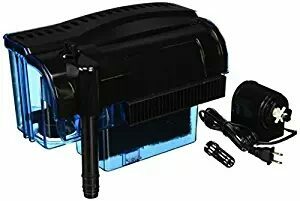 This filter that can easily fit into your aquarium is unique and efficient. This revolutionary filter is worth every penny you may spend on it. It also possesses twice the filter cartridge capacity having an additional chemical filtration capability. The Bio-Wheel allows for wet and dry biological filtration keeping your fish safe and your aquarium healthy. This piece of engineering would be worth its weight in gold, as any aquarium owner that purchases this would have made more than a good bargain. 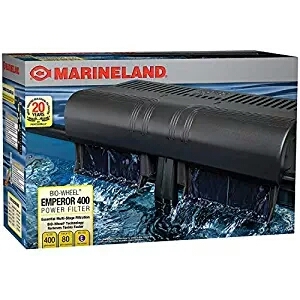 Another Marineland productMarineland product, this is the right product for new aquarium owners. This easy to set up filter can easily be mounted in your aquarium, this filter comes with a 3-stage filtration system. Its mechanical portion screens out dirt and debris, the organic part with its patented Bio-Wheel eliminates toxic ammonia and nitrate allowing growth of beneficial bacteria. The chemical sector of this filter removes odors, discoloration, and impurities with its dark diamond premium activated carbon. 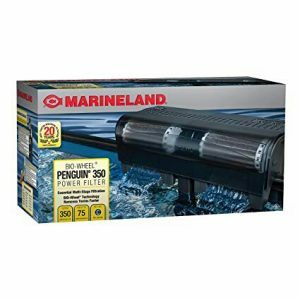 This filter is perfect for aquariums of up to 70 gallons, possessing convenient Penguin Rite-Size cartridges that are ready to use with each filter. Many hang on back filters in the market may fall short of expectations due probably to the low-quality materials used in their manufacture. The Seachem Laboratories 6500 55gallon/ 208 1/120V/60Hz Tidal Filter will change your outlook on back filters. 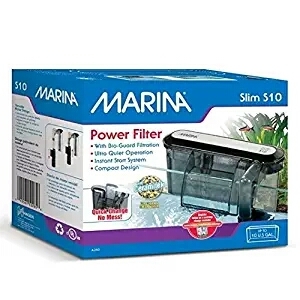 This filter comes with some exciting features, from a self-priming pump which can clean itself to a surface skimmer; this filter is any aquarium owner’s dream. The Tidal filter is fitted with an adjustable flow such that the water can be regulated efficiently by you. Its self-cleaning impeller is the icing on the cake, as most impellers are challenging to clean. This versatile filter can be used for saltwater and freshwater. 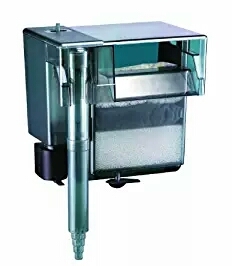 Acquisition of this filter is a win-win for you and your fish, as it would save you difficulties involved in cleaning but will still provide excellent quality and safe environment for your fish. 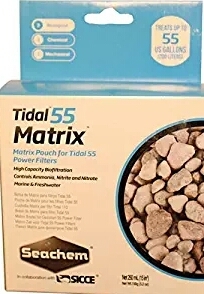 This filter is the best hang on back filter for your small aquarium. Although using a regular sized filter can be effective, smaller filters are highly recommended mainly due to their ability to control water flow in your small tank. 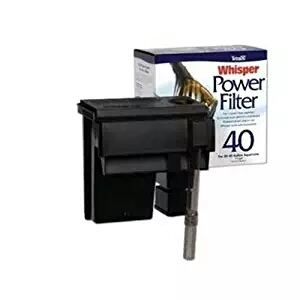 The Tetra Whisper filter is designed for use in the aquarium of size up to 40 gallons. This filter utilizes large Bio-bag cartridges. These can be easily replaced when need be to ensure continued use of the device. This Filter can also get to those elusive corners of your tank, making it great for fish health and water cleanness. This filter is perfect for you, especially if you just got into the aquatic lifestyle. This simple piece of technology is ideal for beginners. It is ideal for nursery tanks but is difficult to source for its replacements in the market. The name kind of gives it away, as this quiet back filter is the best in terms of noise efficiency. This filter has a 4-stage filtration system, and they are chemical, biological, mechanical and wet/dry. This lets the water be clear, clean and healthy, thereby translating to healthier fish and plants in your tank, due to higher dissolved oxygen content for the plants within the tank. This filter houses an internal pump design that dampens noise, also eliminating leaks and starts up automatically after cleaning. The Penn Plax Cascade Hang-on Power Aquarium is a very new hang on filter which is perfect for your tank. Its improved technology helps it deliver 300 gallons per hour of clear water for your fresh or marine aquariums. This filter comes in various sizes and ci handle between 55 to 100 gallons. It’s never seen before Bio-falls Quad filtration system provides efficient filtration. This mode of filtering allows anaerobic bacteria to thrive. It has an activated carbon cartridge which removes harmful chemicals, toxins, odors. An adjustable flow knob in the filter allows you to reduce filtration during feeding times. This filter, however, gets noisy when in use, creating a disturbance for the fish. This small, slim and compact filter help economize space behind your aquarium. It has got adjustable flow control, making it easy for you to control the water flow and level in your tank. 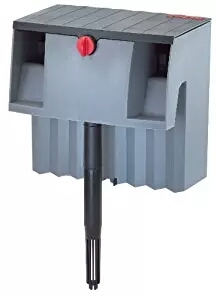 This filter is occasionally noisy due to its submerged motors, which allow an easy start-up devoid of priming. This filter is engineered to optimize biological filtration, ensuring a healthy aquarium. Its noisy operation makes it unsuitable for sensitive aquatic creatures. Every aquarium owners dream is to have healthy fish and healthy plants. Aquarium filters are the bedrock of any aquarium. We know our picks up there have given you a wonderful insight into the market, what to purchase and what to look out for before every purchase, helping you secure only the best hang on back filter.